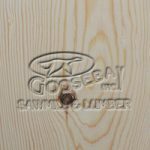 Red (Norway) Pine - Goosebay Sawmill and Lumber, Inc.
Red Pine, also known as Norway Pine, has a wide distribution in the Eastern United States. It is found in New England, New York, Pennsylvania, and the Great Lake States. The heartwood varies from a pale red to a reddish brown, the sapwood is nearly white with a yellowish tinge and darkens with time. It tends to be straight-grained, but is generally not as uniform in texture as Eastern White Pine. Red Pine has a relative hardness of 560 when dry. Red Pine is easy to work, stable when dry, and will take glues and fasteners well. The Red Pine that we stock has been milled into flooring. Although it may be less known than White Pine as traditional flooring, it was in fact used for the original flooring in many local houses in the Colonial era. It is generally described as being just a little harder and more durable than the White Pine. Red Pine is used for lumber, log cabin siding, poles, pilings, millwork, and pulp. The bark is used for tanning and the stumps are used for turpentine and rosin production. We occasionally have some 10 or 12 inch pieces on hand. We can also special order select grade (fewer knots) – minimum quantities may apply.